Forget the Great Barrier Reef, forget Sydney Harbour, and forget cultured Melbourne. If you are an international tourist consider coming into Australia through the front door of Darwin and Perth... It may be a culture shock but the aboriginal dreamtime legends will begin to have resonance. The east coast is fabulous, but the outback is unique. All the omens were positive from the outset. This was going to be a good family holiday. A feeling of calm and simplicity began in the most unlikely environment: the airport. A laid-back country setting, a big shed and no queuing. One plane — our plane — sat on the tarmac awaiting adventure. Even the name of the airport suggested tranquility: Avalon. It may not be super-modern but it has a rustic charm. A short walk across the strip, up the steps and we begin our transformation which takes us across the country and into the dreamtime. A day in Perth, to organize essential supplies, namely a comfortable car, cruise-control for the long road ahead and packets of chips for the kids. Big sky country waits to the north. There is one coastal road but we still get lost. Our first leg is a practice run to the white beaches of Jurian Bay. We decamp at the prebooked caravan cabin and the kids examine its features with the critical scrutiny of expert food critics. I await their judgment of raised eyebrows or a damning “what were you thinking, Dad?” Luckily today the verdict is favourable as they dispense all their games and clothes through the bungalow and under the beds. 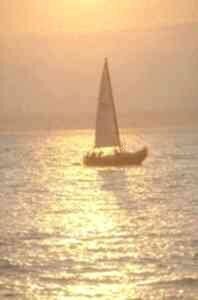 We have really arrived in the West as we watch the sun set like an orange flame into the Indian Ocean. A relaxed day is spent exploring the strange Pinnacles at our leisure. Joe finds this wide expanse of rocky outcrops in a desert setting a perfect place to test his mini football. The landscape is an atmospheric badlands straight out of Star Wars. At tea I bring out the map and explain our long haul drive for the morrow. 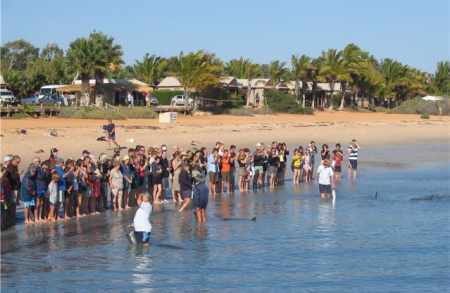 I point out our target as Shark Bay and Monkey Mia. They look at me as if I’m a mad captain in a B-grade war movie. Monkey Mia and dolphins I mumble. Something weird begins to happen at Shark Bay. It is the beginning of a time where rules and clothes drop off as we go feral. The butcher shop is closed — gone fishing for four days! The paper may be here tomorrow. The pizza shop has closed down because it was too busy. All the important things don’t seem to matter here, and I find I like it. Relax, take your thongs off, let the sand through your toes and the salty sea in your hair. We are entering Ningaloo time and a land of endless horizons and a turquoise sea. Nature and the elements are taking over. Even the resort at Monkey Mia has a laid-back charm. The dolphins and tourists are languid; no rush; no tension. The catamaran cruise to sail with the dugongs and turtles is refreshing and fun. The crew has laconic instructions to swim to the dinghy they will be on if we sink and if your hat blows off put up your hand to wave them goodbye. A day’s drive and the jewels of the reef begin to shine at Coral Bay. Camp behind the beach and walk across pure white sand into an underwater wonderland. Knee-deep and the fish abound, our first welcome a giant sting-ray skimming around our feet. Initial panic and thoughts of Steve Irwin until the weird flying saucer zooms out to deeper water. In half an hour our young family has acclimatized to snorkeling and is duck-diving to chase pools of fish and explore coral outcrops. Loop into the lazy ocean current moving slowly north and drift effortlessly across teeming platforms of coral. A set of flippers and goggles and this natural wonder is available to view at your leisure. No boats, tickets or tour guides required. The next day I find myself swimming with ancient looking green turtles with big sorry eyes. I frantically signal to the kids ashore until I realize any more waving will look like a shark attack. The underwater life is relaxed and calm; this is their territory and you an invited guest. A visit on a glass bottom boat to the outer reef and we get a glimpse of Big Bertha, an enormous groper who owns this inlet. She is the boss and will only let select males in for short nocturnal encounters. The next day we push north as far as Exmouth Cape and the sparkling waters of Turquoise Beach. Huge underwater flower sculptures abound while whales breach and roll offshore. This part of the world really is a secret special place. The family has morphed into travelling gypsies and camping is now our thing. Camp cabins might look like shipping containers but living and eating is done outdoors under shady gums or on balmy nights looking up at the brilliant Milky Way and Southern Cross. This is perfect telescope and satellite tracking country. The weather, as they say in the classics, is beautiful one day and perfect the next. It is with regret we turn to make the run back to Perth. The only billboard spotted in 1000 km is an arrow pointing to a shed reading “If its buggered we’ll fix it”. The never ending country is alive with wildflowers and we break up the two-day marathon with a stop over at Kalbarri National Park. 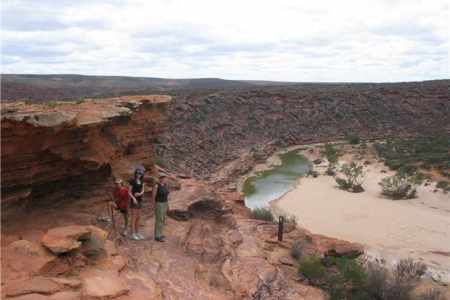 Like innocents abroad we begin a walk through the famous Kalbarri Gorge. After two hours under a hot sun we begin to feel alone and slightly vulnerable in this rugged country. I start rationing the water and as the country closes in the kids stop fighting and we play rock identification games. To groans, I start singing always look on the bright side of life. I tell stories about the early explorers but change the subject in the middle of the Burke and Wills expedition which I remember ends with their horrific deaths in the desert. Our walk in the park turns into a four hour epic. The sight of the car park brings huge sighs of relief. We are very proud of ourselves and after high-fives we excitedly review our courage in adversity. It has been a breathtaking trek through amazing rock formations and a river lined by towering gumtrees and sandy banks. A day in Perth begins our transition back to civilization before the redeye special across country to our urbanized home. For our family this has been a holiday to remember, we have been drawn into the country and found a relaxation gear we never knew existed. Forget the Great Barrier Reef, forget Sydney Harbour, and forget cultured Melbourne. If you are an international tourist consider coming into Australia through the front door of Darwin and Perth. Feel the power of the landscape in places like the Kimberley’s, Kakadu, Ularu or the Ningaloo Coast. It may be a culture shock but the aboriginal dreamtime legends will begin to have resonance. The east coast is fabulous, but the outback is unique. What you could see diving at Ningaloo Reef. 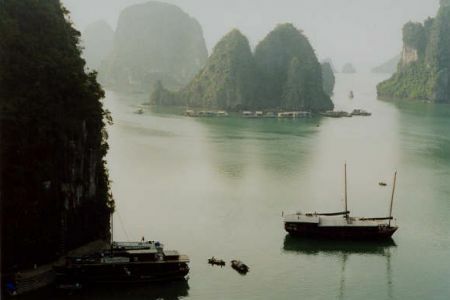 If you enjoyed reading the above article then you will probably also enjoy Ho Chi Minh City by Christopher Loughnan, and the Whitsunday Islands, also in Australasia, and our latest articles covering the Orinoco Delta, La Mata, Marbella and Beijing.